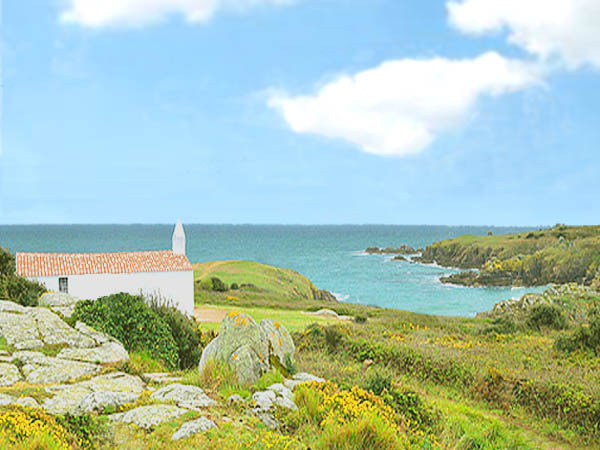 Only 10 sea views from all the spectacular scenery offered by the French coastline. The choice was very difficult, trying to illustrate the variety of landscapes. The only goal: to make you dream. Raiatea is a Polynesian island located 210 kilometers from Tahiti, between Huahine and Bora Bora. 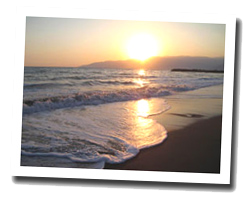 Few beaches but deep bays and spectacular seascapes that will delight lovers of diving and hiking. Raiateaa preserved remains of ancient Polynesian religions. 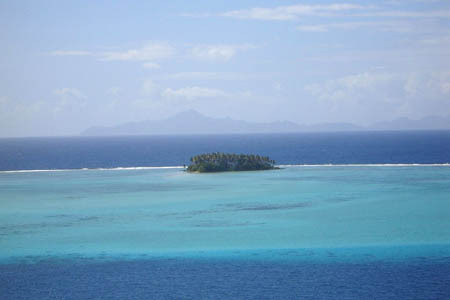 The lagoon is surrounded by small islands called "motus". Located on the Emerald Coast, Dinard is one of the most famous seaside resorts in Brittany. 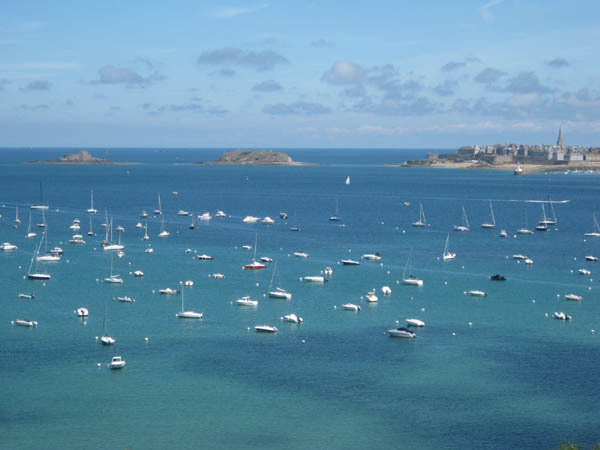 The Prieuré Bay faces St Malo and serves as a port to many sailboats. A pleasant promenade planted of exotic species borders this sheltered cove. It is dominated by magnificent seaside villas. Many of which are classified and belong to well-known french personalities. 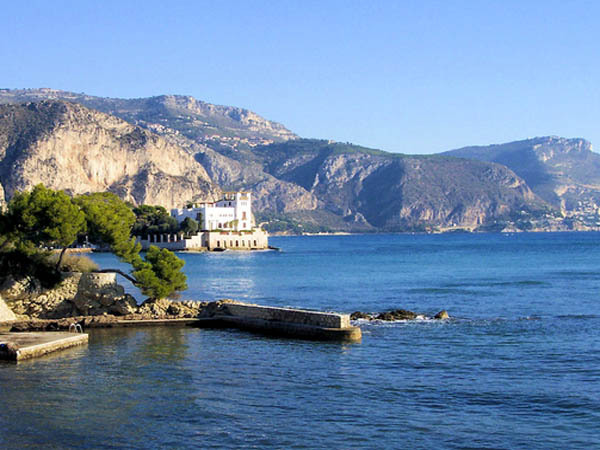 The Baie des Fourmis is located between Beaulieu-sur-mer and the peninsula of St-Jean-Cap-Ferrat, close to Nice. The billionaires of all nationalities like to anchor their yachts in this beautiful site: mountains in the background, the Kerylos villa overlooking a sea with changing colors, the Paloma beach ... A coastal path runs around the cape. On the other side, we reach the bay of Villefranche, another treasure of the French Mediterranean coast. 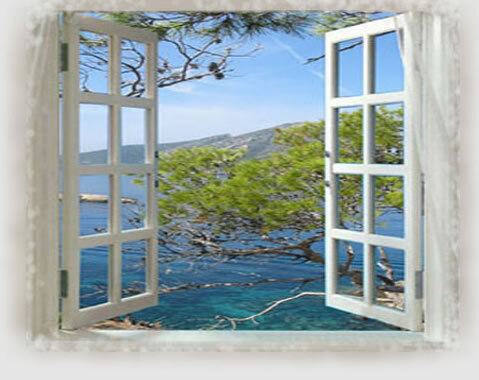 As sing a famous French singer, we would to stay there forever watching the sea. 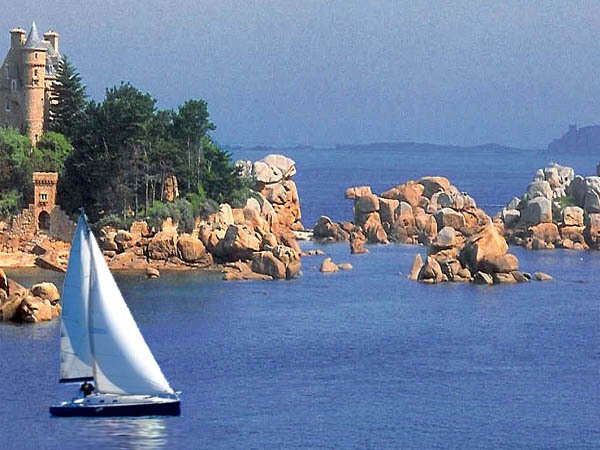 The Côte de granit rose or Pink Granite Coast is a stretch of coastline in northern Brittany. Off the beach of Saint Guirec, Costaérès castle watches over a chaos of pink rocks sculpted by wind and sea. Sailing boats weave between the rocks, gulls are lulled by the sea breeze. Between Perros-Guirec and Ploumanach, the coastal path offers one of the most beautiful promenades in Brittany and probably in all of France. 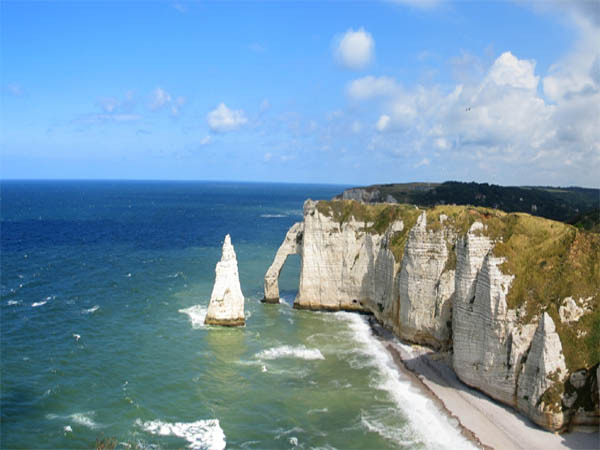 Between Le Havre and Le Tréport in Normandy, the Côte d'Albâtre (Alabaster coast) takes its name from the white chalk cliffs that can be up to 120 m above the sea. Le Tréport cliffs are the highest, those of Etretat the most famous thanks to the famous "Aiguille" often reproduced by painters. Hiking trails along the coast offers magnificent views of the sea and cliffs. The coastal road located at the foot of Esterel mountains is called the Corniche d'Or (gold cornice) because of the beautiful scenery. 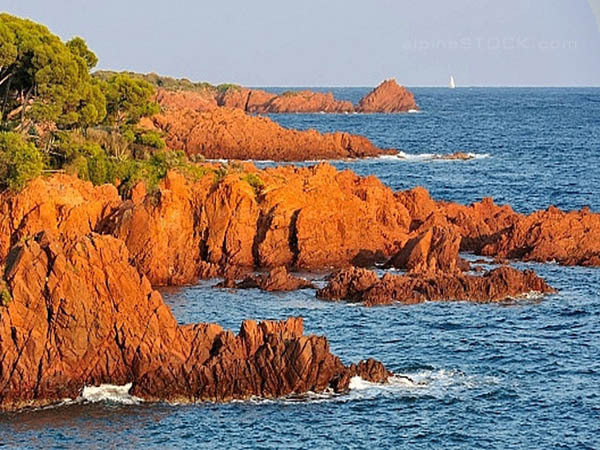 The most spectacular part of the coast is the peak of the Cap Roux where red porphyry fall into the sapphire blue Mediterranean Sea from a height of 452 m. From Cannes to Saint Raphael, the scenery is especially beautiful in the late afternoon, when the sun begins to fall. Turquoise sea, white sand, unspoiled nature, atmosphere of Polynesian island ... yet we are in the south of Brittany, in Finistère. The islands form a circle around a kind of lagoon called "La Chambre." The paradise a few kilometers from Bénodet, one of the most enjoyable seaside resorts in Brittany. 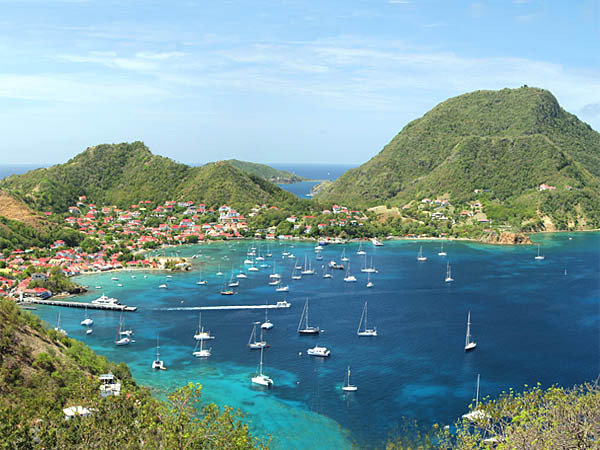 Terre-de-Haut is an island of the archipelago of Saintes located in the French Antilles. The village opens on a bay regarded as the third most beautiful bay in the world, after those of Rio and Halong. Overhung by a mountain covered with greenery, it evokes Rio without its concrete buildings. 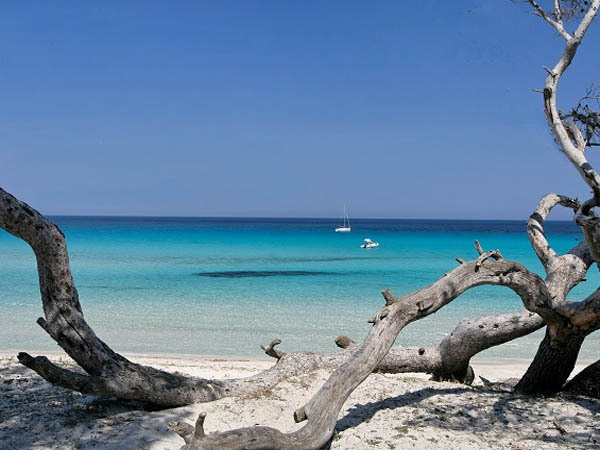 What is the most beautiful Corsican beach? Difficult to choose. 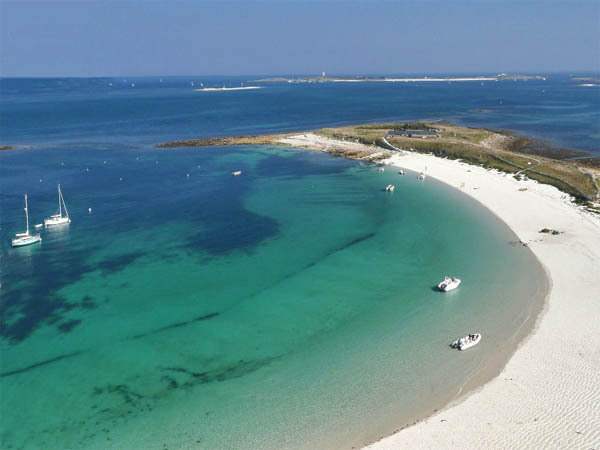 The Agriates coast, between St-Florent and Ile Rousse offers beautiful landscapes, such as the beach of Saleccia with its white sand, clear waters and its dunes with Junipers. It is accessible by 4x4, boat or by expert hikers. 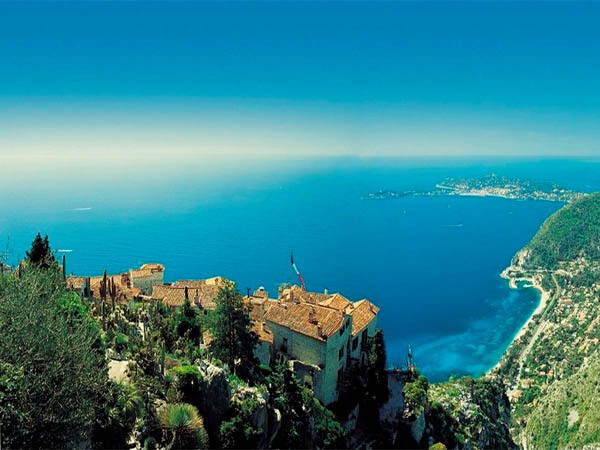 The exotic garden of Eze is a belvedere overlooking the Mediterranean sea. You will feel floating between sky and sea while the course of time stopped. The bustle of the Riviera seems far away in the serenity of a landscape populated by sculptures called "Earth Goddesses". A little bit of Vendee, a little bit of Brittany, a little bit of Greece ... Yeu island is a really surprising destination. Dunes, rocky coast and small ports with colorful boats line the coast, including the picturesque port de la Meule set into cliffs covered with wild moors. A chapel with white walls is watching over sailors in a landscape that seems forgotten by the passage of time. The one you have for your holiday house, bungalow or hotel room! Select your sea view with seaview-france.com. A choice to suit all budgets from Calais to Polynesia.